Made to fit Miele S7 series upright vacuum cleaners. Designed to fit Miele S227,S858, S4000, S5000 vacuums. Package contains 3 filters. These bags are made from a synthetic cloth type material, with a plastic mounting collar and are the after market bags nearest to the factory Miele bags without the high cost. Package includes 5 bags and 2 filters. Replacement paper bags designed to fit Miele style G/N canister with plastic collar. Fits S-4000i,S456i, S5000-S5999, S600-S658 and S800-S858 Miele machines. Sold with 5 bags per package plus 2 filters. Designed to fit Miele Uprights using Style K bags. Package contains 5 bags and 2 filters. Designed to fit Miele canister vacuum that use styles G and N bags. Fits Miele vacuum models S400i-S456i, S5000 - S5999, S600-S658 and S800-S858. 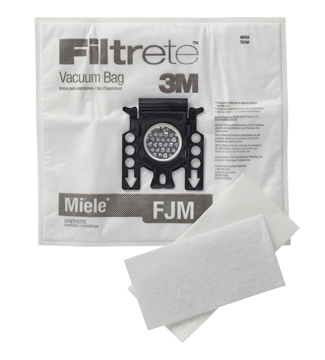 The Filtrete 3M 68704A replacement vacuum cleaner kit includes 5 vacuum bags and 2 replacement Miele FJM filters. These vacuum bags feature a synthetic filter media that captures up to 3 times more household dust, pollen, grass, dust mite debris, bacteria, and other allergens than standard paper vacuum bags. The flexible and tear-resistant material expands as you vacuum and provide greater suction even when full over standard paper where loss of suction is a possibility when they are only half full.